Yusaf Pathan steered India to an improbable victory at Bangalore in their fourth ODI against New Zealand on Tuesday. Gautam Gambhir won the toss and put New Zealand in to bat bat who laid down a huge score of 315 runs. Chasing this mammoth score, India, at one stage were 188 for 5 having lost the top five batsmen. But Yusuf Pathan was was on a different pedestal altogether. He struck with confidence and stamped authority with his each shot. His 97 ball 123 runs were ample proof that Pathan has given a notice to the selection committee for the forthcoming World Cup. His century overshadowed a superbly-crafted 98 from James Franklin that had allowed New Zealand to reach a daunting total. It rained for about an hour and when play resumed again, India needed 113 runs from 14 overs a difficult task which was made easy by Yusuf Pathan. Yusuf launched a Daniel Vettori delivery into the stands beyond long-on and shot a delivery from Kyle Mills over the roof. Hyderabad. The second test between India and New Zealand ended in a draw on the fifth day on Tuesday. New Zealand had given India a target of 327 runs with not enough time left in the game to achieve it. India batted for 17 overs after tea wherein Sehwag was able to delight the crowd with a 50. Thereafter the two teams decided to call off the match. 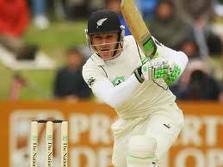 Brendon McCullum reaped rewards for his hard work and got third-highest score in Tests in India. The game was headed for a draw the moment Zaheer Khan left the field again after bowling just three overs in the morning session. New Zealand has now held India, the No. 1 side, to four consecutive draws. M.S.Dhoni won the toss and opted to bat first on a newly laid pitch at the Dambulla Stadium on Wednesday. New Zealand tried their best to reach the final of the tri-Series, but India were in a victory mode and never relented all through the game, and India beat New Zealand by 108 runs. Batting first they amassed 223 runs, almost half of which were scored by Virendra Sehwag, and then the Indian pacers wrecked havoc on their batsman and budled them out in a meager score of 118 runs. After the loss of four quick wickets, M.S.Dhoni gave Sehwag the required support by rotating the strike and played the sheet anchor role at the other end, while Sehwag plundered his century. Dhoni and Sehwag put on a 107 runs partnership. Once Sehwag was out, the Indian tail was wiped out quickly by the New Zealand bowlers. Sehwag also managed to hit his 1000th ‘four’ in ODI cricket. New Zealand bowlers bowled very well and took the wicket of Dinesh Kartik with India at no score and Virat Kohli also gave the faintest of nick to the wicket-keeper. Both these batsmen were caught fishing outside the off stump.